There are many decisions that go into furnishing a luxury home or condo, and the larger your home is, the more complex it becomes. Each selection affects the next and it can quickly become overwhelming. This, complicated by the fact that most of our clients would prefer to spend time with their families when not busy working or running a household, can make finding the time to create a beautiful home environment near impossible. Our expertise is efficiently sourcing and specifying furnishings that ensure the best use of space planning, proper scale and in the end, a beautiful and harmonious living environment. We have access to quality and unique items that are not readily available to the retail public. 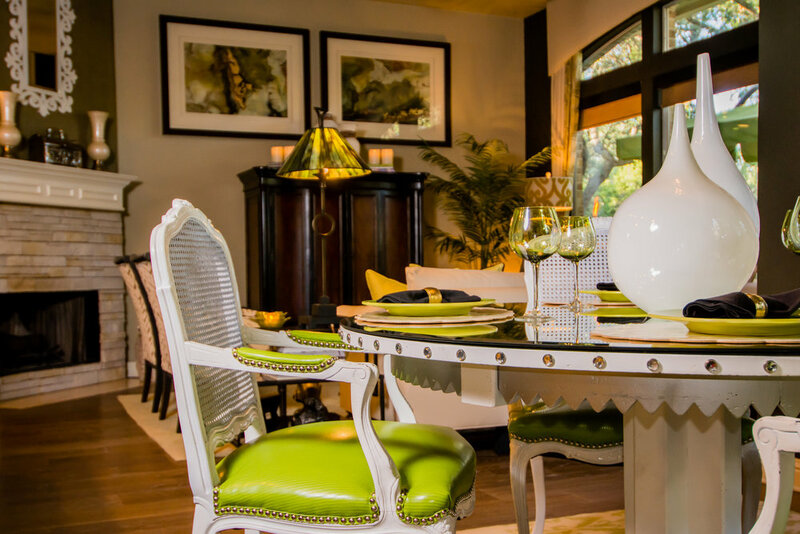 The ability to handle multiple rooms or whole house furnishings at once is where we shine. We utilize a project management system tailored to the interior design industry, through which we are able to plan complete rooms and whole house projects with ease. We work best with clients who prefer to have little involvement in the design process but are seeking a beautiful and comfortable environment in which to live or conduct business. We always try to incorporate our clients' existing heirloom or sentimental pieces as much as possible to further showcase the individuality of each of our designs. We find that our strength is to do our research upfront to get inside our clients' heads and come up with something special and unique to their style and personality. We will also be candid when existing pieces are not working in a space due to improper scale, or in cases that there is an overabundance of furnishings in order to bring out the harmonious end result we aim to achieve. Often times our clients want our help from the time they start working with an architect to build their dream home or commercial space all the way through to the last accessory. This is an extremely smart decision, as we know how stressful new construction or remodel projects can be, and working with an organized designer to schedule and organize the construction selections will greatly reduce the stress of this process. For new construction and remodeling projects, our firm offers consultation on hard goods selections such as lighting, hardware, counters, flooring, tile, wallpaper, appliances, doors and windows, cabinetry, and plumbing fixtures. We work well collaborating with your architect and builder to complement what they do as we all have different areas of strength. The sooner we are able to get involved with a project, the better the final outcome will be. We'll schedule a complimentary in-office consultation with Robin, and email you a detailed lifestyle questionnaire that will allow us to learn more about you, your lifestyle and your design needs. After your appointment, we will send you an itemized scope of work to estimate each detail of your design project. Robin will come out to your home to take photos and any needed measurements, and then soon after you will be sent a proposed furniture layout for your space. Once the space plan has been finalized, Robin will make all of your interior selections and we will upload everything to an interactive client portal that you will utilize throughout your project. If this is a new build or remodel project, prior to creating a space plan we will arrange a meeting with you, Robin, your builder, and your architect (if you have one) to get a construction timeline. Then you and Robin will visit various showrooms to make all the necessary construction selections for your project before starting on the interior. We will place all product orders and coordinate any on-site construction or measure appointments needed. Orders will be regularly tracked, and you will be able to follow along through your client portal so you will always know what is going on with your project. All of your furnishings will ship to a white glove receiver to be inspected and stored until your final delivery. Once all of your items have been received and have passed our strict quality guidelines, we will coordinate your final delivery and installation appointment. Robin will meet the delivery company at your appointment to assist them with proper furniture and rug placements, supervise the drapery and art installations with our installer, and professionally stage all of your accessories for a beautiful finished look. Often we recommend bringing in an outside installer to assist with picture hanging, especially in conjunction with our design services. The extra assistance allows us to provide efficient service with safe and reliable installations. DON'T LIVE IN AUSTIN? YOUR CUSTOM DESIGN IS JUST A CLICK AWAY! Several years ago our firm expanded our services nationally to clients seeking interiors with our Austin flair for secondary residences and furnished short-term rental properties by developing our room online system, which allows us to virtually design spaces from our Austin office and then source, deliver and install with the help of local resources in different parts of the country. To create your ideal space, we will request room photos and measurements, and with our digital design services you will be able to see 3-D renderings of your new space to ensure you are thrilled with the design. Our 3-D renderings allow our long distance clients to see and approve designs from any location prior to ordering. Our firm has resources available to receive and deliver your product anywhere in the United States, and we will handle all ordering, receiving, installation and deliveries needed for your project, so that no matter where you call home our help is just a click away. Our firm purchases furnishings directly from manufacturers and to-the-trade showrooms, and as a result we are able to offer preferred pricing on product to our design clients. We work solely with quality vendors, most of whom have favorable warranties. We stand behind these warranties and will assist you with any warranty claims that may arise. We will seamlessly and complimentary manage complications such as damaged items, incorrect shipments, delayed or discontinued product lines, and any other issues that may arise during the ordering process, often without our clients even aware that anything has gone awry. We invite you to read through our client testimonies to see how working with our firm can turn a seemingly overwhelming and stressful process into a fun experience with beautiful results. 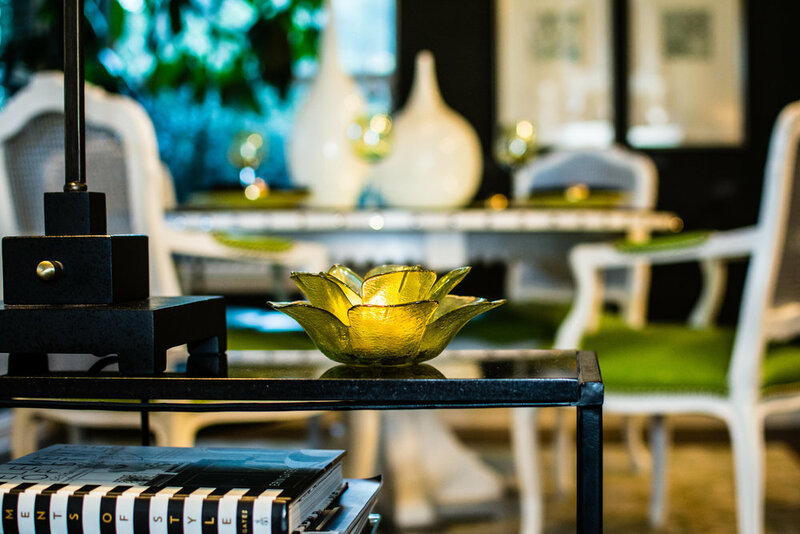 The product lines that we offer through our firm for art and accessories have been specifically chosen to give you the opportunity to find unique, luxury pieces that are difficult to find elsewhere. Many of our vendors work solely with designers and are not available on the retail market, which allows us to create a truly one-of-a-kind space for each of our clients. Standard faux florals and greenery can often have an unappealing plastic-like appearance, but when working with our firm, we specify only the highest quality and most realistic silk floral arrangements to our clients. We also work with a local floral designer to create completely custom arrangements for seasonal and year-round decoration. While we love to incorporate live plants into our designs as well, high quality faux arrangements allow us to recommend plant species that may not naturally thrive in indoor spaces, as well as place them on high shelves and other hard to reach places since regular maintenance is not required. Lighting adds warmth and ambiance to a space, and most homes do not have enough of it. We offer everything from table lamps to chandeliers to ensure that our clients have the five to seven layers of lighting that every fully designed room should have. If wiring is needed, we can refer you to one of our trusted trade partners for installation. We offer a wide array of luxury bedding lines for a unique look to compliment any design style. We also design and create custom bedding including coverlets and comforters, bed skirts, pillow shams, accent and bolster pillows, throw blankets, and upholstered headboards, all complete with dressmaker details. Robin fosters a passion for designing custom drapery, from top treatments and roman shades to motorized traversing drapery. Our firm partners directly with fabric manufacturers to ensure our clients receive only the best first-run fabrics, and with local workrooms to manufacture quality custom window treatments with hand-sewn hems. We employ drapery installation experts to professionally measure and install all of our window treatments. Our firm supplies high quality blinds and shades through companies such as Hunter Douglas and Lafayette. We also offer completely custom shutters with a large array of paint and stain options, as well as the ability to custom-match to any color. Our hard window coverings are made specifically to fit your windows and are professionally measured and installed. We have partnered with several high quality upholstered furniture manufacturers who will work with any of our fabrics or leather. This allows us to incorporate repeat and complementary fabrics from our clients’ window treatments, pillows, table runners or other items so that each piece works in perfect harmony. We also fully design custom case goods such as entertainment centers and armoires to perfectly satisfy our clients' needs. We carry several high quality rug lines to suit any style, as well as many custom handmade rug options in wool, silk, and cowhide to create a unique and beautiful anchor to your space. Through our custom rug companies, we are able to specify every facet of the design, including shape, size, color, and pattern. We can also mix wool and silk sections into the same rug, creating a beautifully deep sheen variance. Our local upholsterers can re-cover any of your existing and heirloom furniture. We can also redesign, reshape, and repair & upgrade cushions to bring new life and style to your current pieces.